We were deeply saddened to learn that RP member Jason Sullivan died unexpectedly on August 25th, 2018, at Southampton General Hospital, aged 60. Jason started his Foundation Art studies at Grimsby College of Technology in 1974, and graduated from his Fine Art degree at Sheffield Polytechnic in 1979. 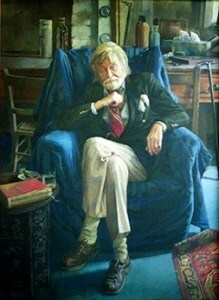 In 1991 Jason won second prize in the BP National Portrait Award, and was elected as a full member of the Royal Society of Portrait Painters in 2003, the same year as his son, Ben. Jason painted portraits of great sensitivity and calmness. Take the portrait pictured here, of retired actor Michael Hobson (part of the People’s Portrait Collection at Girton College, Cambridge) which displays Jason’s understated acuity in full. From the threadbare spine of the red book, and the curled edge of the rug, to the plume of tissues rising from their box on the table behind. Carefully selected details that enrich the wonderful portrayal of the aged actor, sinking into his suit as much as he sinks into the chair. Jason was a popular member of the Society who will be greatly missed. The funeral service will be held at Bournemouth Crematorium on Friday, October 5th at 10.30am.